I rarely install Linux on laptop. It was great to have one and saw how Linux distros progressed in this area. Since last week, I have been a responsible person for one of my office's laptop. I tried installing Fedora Core 6 on it. It was no good. After a couple of minutes, it started to become slower like something was going on in the background. It was so annoying. I tried upgrading the kernel and all the latest updates using yum but to no avail. Of course your mileage may vary. With Mandriva 2007, I was in luck. I got the DVD from LinuxForYou magazine. I am no stranger with Mandriva. I have been using it for 5 years and one of servers I managed using it. 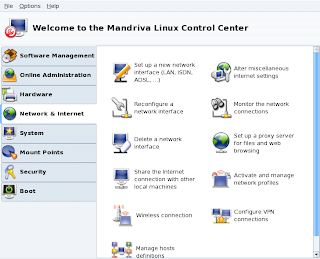 As any desktop-oriented distros, Mandriva is one of the user-friendliest distros out there. It is good and will be better in the future. My laptop is Intel-based. What i mean here is the wireless, CPU and VGA chipsets are from Intel. 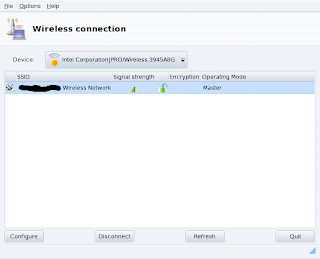 My wireless is ipw3945. No driver for this chipset I could found in the DVD. After googling, the driver is here. This is the kernel module (driver) for the wireless chipset. Hence, I activated it with modprobe : modprobe ipw3945. It created a device called eth1 (eth0 was reserved for wired connection). Click on the Wireless connection. As you see in the diagram below, the AP signal was detected and shown. The button Disconnect should be Connect before you connect your laptop to the AP. If the connection is successful, then you can connect to your network and internet. Contact your network administrator if you have problem. Good luck.